What: Quizzes, Crafts, DVD’s, Bible Stories, Activities, Games and lots more! it’s fun and its free! 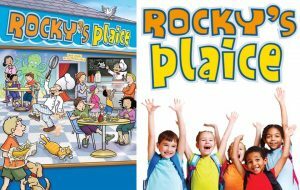 Rocky’s Plaice is a five-day children’s holiday club. The club is based in a fish and chip restaurant that happens to be the meeting place of a church that loves helping children learn about Jesus! When this cafe church was established, the building was renamed Rocky’s Plaice in honour of Jesus’ friend Peter! The holiday club teaches 5 stories from the book of the Bible called Acts. These stories celebrates how God established the first ever churches and the life of the church today.